The minute we think of Goa what we get in our mind is the rich spirit of the state Feni which is made from cashews groen from there. Feni is a traditional liquor distilled from the fermented juice of cashew apples. Feni is sometimes spelled fenno or fenim. 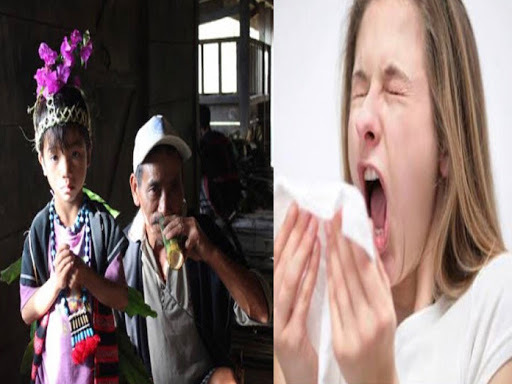 It is safe to drink as it is free from organic or artificial flavors. 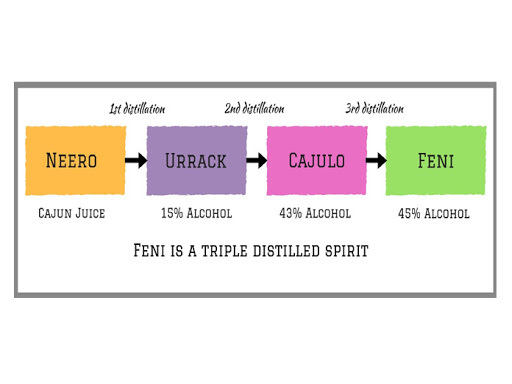 The name "Feni" is derived from the sanskrit word phena which actually means froth. It is due to the fact that bubbles from a light froth when the liquor is shaken in a bottle or poured in a glass. Feni is a part of a Goa food tradition from the last 400 years. Unlike other liquors, it doesn't give you a hangover. It also got the Geographical Indication(GI) certificationin 2009. In 2016, the Goan government initiated the process of declaring it as a heritage drink. The Two popular types of Feni Goa is known are for are-Coconut-Feni and Cashew Feni. In terms of production, Feni is older than cashew Feni Originally the locals made feni with coconut which was available in abundance in Goa. But later cashew tree was inintroduced to India by the portuguese colonists which became the new source of this liquor. It has a very strong taste fruity flavor, a peculiar taste, a very strong and astringent smell. Feni can be served neat or over ice, and can be mixed in classic cocktails or with juices. It can be served with a slice of lime, and sometimes with sugar or sugar syrup, which are popular additions. Popular mixes are cola, tonic water and lemonade, with the latter probably the most popular. Feni is also often mixed with Limca, Sprite or 7UP. In 2016, the Goan government initiated a process for feni to be recognised as a heritage brew outside of the state. Feni was described as a part of the culture by the Goan chief minister. 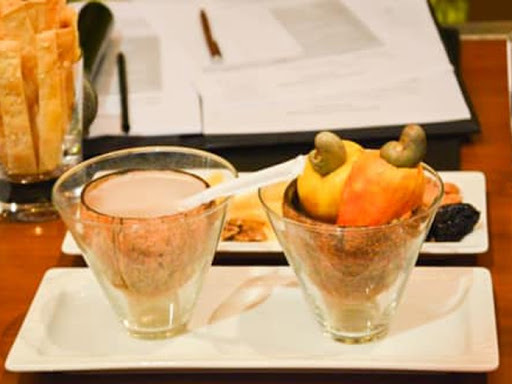 Tourists can see cashew harvesting and follow harvesting and follow the process of the drink's manufacture. 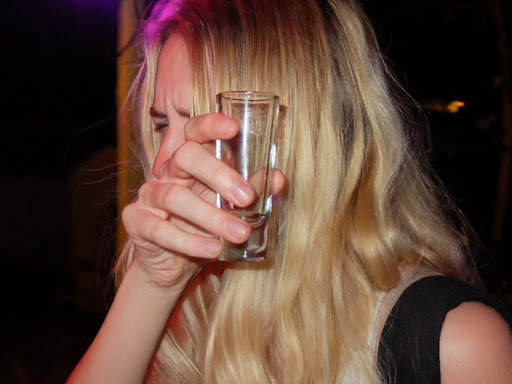 The Alcohol content in feni is 43-45%, which makes the drink very strong and smelly. The aroma is indicative of a carefully crafted Feni. The first step in making Feni is by crushing cashew apples manually on a hilltop rock shaped like a basin. Juice from crushed cashew apples flows out of the basin to an earthen pot or copper pot which is buried deep under the ground for fermentation. Then, the juice is distilled by boiling on woodfire. The juice in the pot undergoes various steps of vaporization and distillation, where only 4% of the fermented juice becomes alcohol. The distillation process of done thrice. The juice is obtained at the first phase of the distillation process is called Urrack whick is light and diluted. Urrack is further distilled into what is know as Cazulo. Cazulo has strong intoxinating properties and is not common in market. The end product of distillation. It works wonders to cure tooth problems, gum issues, swelling and some types of mouth ulcers, people believe that it helps in reducing fat when eaten with certain dishes. It also helps in treating constipation and other stomach related problems.